Wang Dewen's daughter-in-law says the Chinese businessman could be dead. His wife claims he is travelling. But they are sure of one thing: he is definitely not working in North Korea. At least that is what AFP was told during a visit to the home of the shadowy businessman who United Nations experts believe is one of several Chinese traders who may have helped Pyongyang build a fleet of around 300 military drones. The network is believed to form a crucial part of the logistics chain that has allowed the North to fly unmanned aerial vehicles (UAV) that have snooped on a new US missile defence system in the South and taken pictures of Seoul's presidential palace. Last year the UN said the drone transfers illustrate the North's "continued reliance on Chinese middlemen and cash transactions to procure commercial items for military purposes". Chinese companies have also sold the North trucks used to transport artillery rockets, rocket parts, and special types of aluminium useful for its banned nuclear programme, researchers have found. Pyongyang has been embroiled in a high-stakes standoff with Washington over its weapons ambitions, with matters taking a stunning turn as US President Donald Trump agreed Thursday to a historic first meeting with North Korean leader Kim Jong Un. The unprecedented summit has raised hopes of a potential deal, but Pyongyang has so far only agreed to a temporary suspension of nuclear tests, while the White House has stressed that sanctions will remain in place. Beijing is under intense pressure from Washington to crack down on the sales of illicit material, and a UN Panel of Experts has repeatedly asked it to explain how drones were transferred from China to the North. But a forthcoming UN report on North Korean activities seen by AFP says experts have "yet to receive a reply" after asking once more for information from China about individuals who served as intermediaries for a UAV that crashed in South Korea in 2014. China's foreign ministry said in a statement the country has "always comprehensively and strictly carried out UN Security Council resolutions" and actions violating UN resolutions "will be handled according to the law and regulations". Wang Dewen drew the attention of UN experts, but he has proved hard to track down. His office in the northern rust belt city of Shenyang has been occupied by another tenant, and he did not respond to emailed AFP requests for comment. "He's dead," his daughter-in-law told AFP when she answered the door at his home in an upscale Shenyang apartment tower. A few moments later, his wife emerged to say he is still alive, "doing business in the country" and "not in North Korea", she stressed. She was not aware of a 2016 UN report, which said Wang had tried to supply North Korea with miniature, low-light cameras useful for enhancing its drones' surveillance capabilities. His Hong Kong-registered company, HK Conie Technology, attempted to procure the military-grade parts from a Britain-based supplier in 2014, UN experts said in the report. The cameras would be used for security at a major Chinese company, Wang wrote in an export license application submitted to the British government. But the true end user was a "military logistics" company from the North, according to UN experts, citing a British customs investigation. Britain denied the export licence and referred Wang's case to the UN. In correspondence with the UN, Wang denied the cameras were for the North's military, writing that the business HK Conie did with Pyongyang was focused on "civil commodities". He admitted he had allowed North Koreans to use his company's name so they could get "native" prices from Chinese suppliers, and that he had once maintained a bank account in the North for "convenient reception" of payment from companies based there. His involvement in the drones business was news to Wang's wife: "He hasn't told me about that." At least five of North Korea's drones have crashed since 2014, allowing investigators to recover crucial evidence linking Chinese companies to Pyongyang's military programme. One UAV went down in May 2017 in a South Korean mountain range near the border following a five-hour flight that likely took it over Pyeongchang, the site of this year's Winter Olympics. The downed drone contained more than a dozen photos of the THAAD missile defence system recently installed by the US military on a former golf course deep in South Korea. Since 2006, UN sanctions have forbidden the transfer to the North of UAVs with ranges over 300 kilometres—well under the 490 kilometres flown by the drone that photographed the THAAD system. The North had taken steps to erase the serial numbers in an attempt to "obfuscate the origin" of the drones, according to the upcoming UN report. 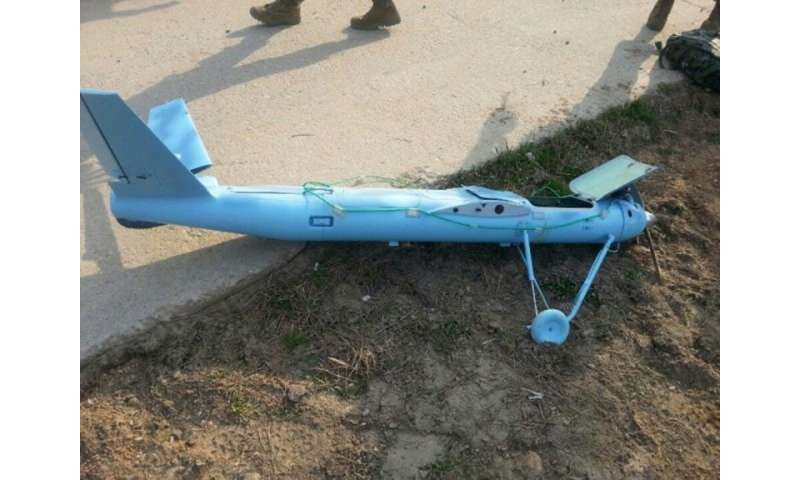 But the make of the downed drone's engine and autopilot—its onboard computer—matched those of another North Korean UAV that crashed on the South's Baengnyeong Island in 2014 and led UN investigators to a Beijing-based supplier, RedChina Geosystems. The firm, which sells mapping equipment for drones among other products, purchased 10 export-controlled autopilots from Canadian company Micropilot for "civil mapping", according to a document republished by the UN in 2016. RedChina subsequently installed the devices in seven drones before selling them onwards. "Chinese people bought them from us," RedChina's CEO Sam Chen told AFP. "How they ended up in the DPRK, I don't know," he said, using an acronym of North Korea's official name.